Do you eat chickpeas? Growing up I don't remember my mom using chickpeas in the kitchen. It wasn't till I met my in-laws and had dinner over at their house, I tried chickpeas for the first time. Ever since I have been loving chickpeas. Why should you incorporate chickpeas into your diet? Chickpeas have many health benefits. They help with weight-control, digestion, inflammation, cholesterol level, and help with blood, bone and heart health. 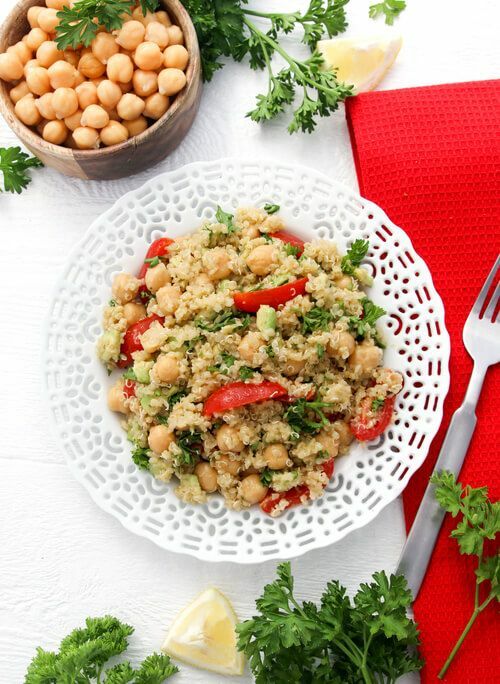 Try chickpeas in this quinoa chickpea salad! What other benefits does this salad bring? This Quinoa Chickpea Salad is perfect for those on a gluten-free diet. The quinoa is the source of gluten-free and a high protein grain. Quinoa is also a low-fat protein option. Another great thing about this salad, parsley. This green vegetable is teeth strengthening and immune system boosting. One more ingredient I will mention, the olive oil, really benefits your skin. Along with that, olive oil can hold your blood pressure low and keep the gallbladder healthy. Combine 1 cup cooked quinoa, 1/2 cup cooked chickpeas, 5 sliced cherry tomatoes, chopped 1/4 of red onion, chopped avocado, 1 Tablespoon chopped fresh parsley. Dressing: Whisk together 2 teaspoons dijon mustard, 1 teaspoon lemon juice and 1 Tablespoon extra-virgin olive oil. Stir in with quinoa, add salt to your taste.